SAVOIA-MARCHETTI S. 73 MACHINES are used on the Continental services of Sabena, the Belgian air line, and on the route to the Congo. Accommodating eighteen passengers, this low-wing monoplane has a span of 78 ft 8½-in, a length of 57 ft 2½-in, and a wing area of 1,000 square feet. Maximum speed is about 210 miles an hour. Civil aviation in Belgium is controlled by SABENA. The name is made Up of the more important initial letters of the Societe Anonyme Beige d’Exploitation de la Navigation Aerienne (Belgian Public Company for the Exploitation of Aerial Navigation). This company operates all Belgium’s public air services as well as private charter services for the transport of passengers, mail and freight. Sabena owes its origin to SNETA - the Syndicat National pour l’Etude des Transports Aeriens (National Syndicate for the Study of Aerial Transport), which was founded in November 1919. In 1920, Sneta began to operate three services: Brussels- London, Brussels-Paris and Brussels-Amsterdam. Thus was founded Belgium’s first air line system. When the practicability of regular air lines had been demonstrated, the syndicate suspended its services, and in May 1923 Sabena was formed by the syndicate, the Belgian Government and the Congo Government. At first the company carried newspapers on the route between Brussels, Ostend and Lympne (Kent). In 1924 the first passenger service on the route Rotterdam - Brussels - Strasbourg - Basle was begun, this service being discontinued later. The company has steadily extended its routes and now, with associated companies, provides connexions between Belgium and more than 120 destinations. The services comprise the European system, the line to the Belgian Congo and the lines within that colony. The continent of Europe is well served by Sabena, operating alone or in conjunction with other companies. During the summer season the services are liberal. To Germany, for example, there are three services daily in either direction by Sabena and Imperial Airways, between London, Brussels and Cologne. Sabena and Deutsche Lufthansa in conjunction run two services daily in either direction between Brussels and Berlin, with stops at Dusseldorf or Essen (Mulheim). The two companies operate also a daily service from Brussels to Frankfurt, Munich and Vienna and back. Sabena is also responsible for the daily “Nord Air Express” between London or Paris and Northern Scandinavia, with a connexion from and to London. The “Nord Air Express” flies by way of Brussels, Hamburg, Copenhagen and Malmo (Sweden), whence there are rail connexions to all parts of Norway and Sweden. Between Brussels and Prague the daily service in either direction is operated in conjunction with the Czechoslovak State Air Lines. There are five daily services in either direction between Brussels and London in conjunction with Imperial Airways and Deutsche Lufthansa. Another route between Belgium and England is that from the coastal resorts of Knocke (Le Zoute) and Ostend to London and vice versa; there are two services daily in either direction. On the Brussels-Paris route there are three services daily in either direction, operated in conjunction with Air France and KLM. The interior of Belgium has not been overlooked, for there are five daily services in either direction between Brussels and Antwerp. The night mail service from and to Brussels enables mail posted in a European capital to be delivered at its destination the next morning. All first-class mail (see the chapter “Air Mails of the Empire” on pages 234-239) to Scandinavia, Finland, Czechoslovakia and Great Britain is carried without surcharge. Among the fragile articles which have been carried by Sabena are scientific and mathematical instruments, radio sets and lamps. Money, documents, jewellery and precious metals are among the most valuable freight. Films, newspapers, serum, medical supplies, vaccines and spare parts for machinery are some of the most notable articles sent urgently by air transport. The air services from Brussels provide substantial savings of time compared with surface transport. The biggest saving is on the Scandinavian route, for Copenhagen is reached in three hours twenty-five minutes, compared with twenty hours by surface routes. In another ten minutes the air passenger lands at Malmo. London is one and a quarter hours from Brussels by air, and six and a half hours by railway and steamship. Even on routes where there is no sea barrier to decelerate communications, the aeroplanes carry passengers from Brussels to the chief cities of Europe much faster than express trains. Vienna is reached by air in less than six hours, compared with seventeen hours by express, and Munich is reached in three and a half instead of over sixteen hours. On the European routes the machines include the Savoia-Marchetti S.73, which accommodates eighteen passengers. This low-wing monoplane has a span of 78 ft 8½-in and a length of 57 ft 2½-in; the wing area is 1,000 square feet. Total payload is 3,960 lb. Top speed is about 210, and cruising speed at 13,000 feet 180 miles an hour. Silencing is good and the equipment of the cabin includes excellent ventilation. The rate of climb is about 13,000 feet n twenty minutes. New Savoia-Marchetti monoplanes of the S.83 type are being added to the fleet. The S.83 is the ten-passenger model evolved from the S.79, which won the Istres (S. France)-Damascus-Paris race in 1937. The three engines give a maximum speed of 264 and a cruising speed of 217 miles an hour. Three of these machines were due in 1938 to be placed on the route to the Belgian Congo. They are among the fastest air liners in the world. Another type is the all-metal Junkers Ju.52, seating sixteen or seventeen passengers. This three-engined low-wing monoplane has a length of 62 feet, the wing span being 95 ft 11-in and the wing area 1,190 square feet. Maximum speed is 174 and cruising speed 162 miles an hour. The Sabena engines are overhauled completely after 600 hours of flying and the fuselages after 1,500 to 2,000 hours. Each machine is inspected by mechanics on arrival and before departure. In Africa the transport difficulties of the vast territory of the Belgian Congo caused investigations to be made soon after the war of 1914-18 as to the prospects of air travel. These investigations began in 1919 at the instance of King Albert of the Belgians and the Roi Albert line was formed. The first service was between Leopoldville and Stanleyville on the River Congo, and was operated by Levy-Lepen seaplanes. This line, said to be the first colonial air line south of the Equator, was taken over by Sabena, and new services were introduced. Surface transport in the Belgian Congo is complicated by the fact that the Congo River is interrupted by rapids and cataracts. Railways are costly to build and operate because of the steep climb from the coast to the interior, and vast regions of jungle and desert separate the rich mining region inland from the coast. 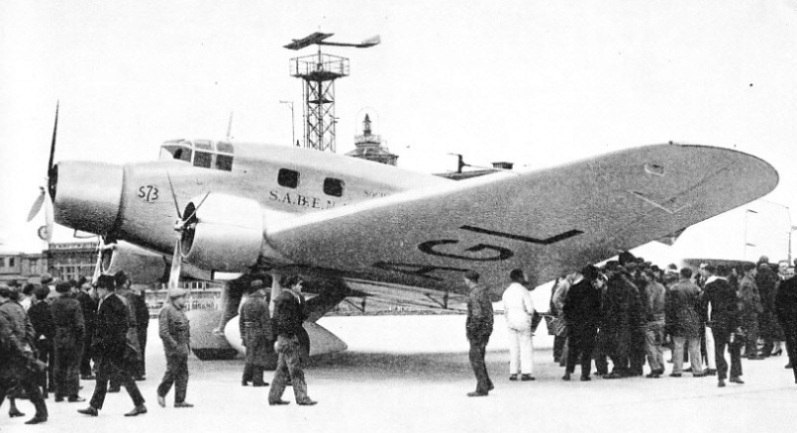 AN ALL-METAL AEROPLANE used by Sabena is the Junkers Ju.52, seen here at the airport of Brussels. Seventeen passengers can be accommodated in this machine, which has a maximum speed of 174, and a cruising speed of 162 miles an hour. It has a span of 95 feet 11-in, and a wing area of 1,190 square feet. Engineers solved the problem of transporting copper and other heavy minerals by building lengths of railway to enable heavy freight to by-pass the unnavigable sections of the Congo River. In addition, they built railways in the mining region and linked these to lines from South Africa, Portuguese East Africa and Angola, the Portuguese territory south-west of the colony. Although communications were thus established between the ports and the heart of Africa, passenger traffic was comparatively slow. The way was open for the development of air routes to carry officials, civilians and urgent freight. At first the air services were limited to the colony, but they are now linked with Belgium and with Madagascar by arrangement with France, and also with South and East Africa. Thus they connect with the African route of Imperial Airways. 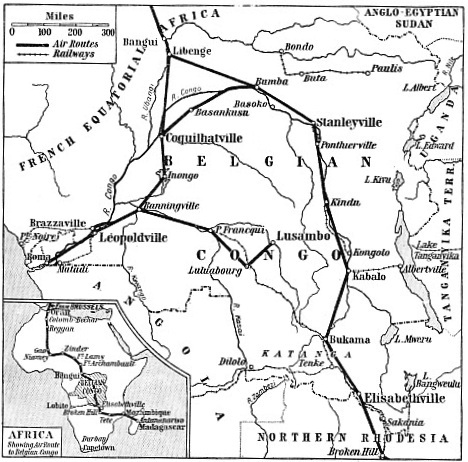 The trunk route from Europe to the Belgian Congo is operated in conjunction with a French company, the Regie Air Afrique. Once a fortnight a Sabena aeroplane leaves Brussels for Elisabethville. In the alternate weeks the passenger is flown by Sabena to Paris and then by Air France to Algiers. From Algiers a machine of Regie Air Afrique flies him to the Belgian Congo. There are similar services in the reverse direction. The Sabena service was inaugurated in February 1935 with two three-engined Fokker machines named Edmond Thieffry and Leopold Roger. Although the service was then not fully adapted for passenger traffic, 129 passengers were carried on the first twenty-three flights, in addition to nearly 40 cwt. of freight and 86 cwt. of mail, representing about 874,600 letters. The original route was to Leopoldville, but with the twentieth flight in November 1935 the route was extended to Elisabethville, the centre of the mining region in the heart of the colony. 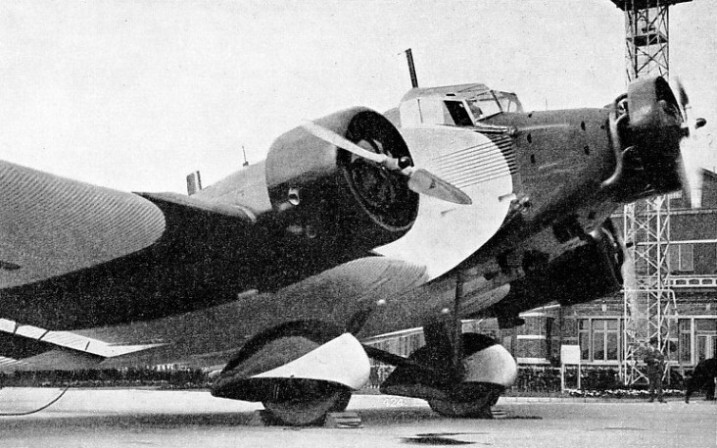 After exceptionally regular service the Fokkers were replaced in October 1936 by more powerful three-engined Savoia-Marchetti machines, and the original route was modified to afford, with the faster machines, a flying time of forty-four hours. These were due in 1938 to be replaced by the fast Savoia-Marchetti S.83 monoplanes referred to above. The intention was to fly in Africa in the mornings only, leaving the afternoons free for visits to places of interest or for resting. Flying time was to be reduced to twenty-four hours, exclusive of stops. Passengers would fly a daily average of six hours for four days; the schedule of four days for the journey might be reduced later. AIR ROUTES IN THE BELGIAN CONGO. The inset in the bottom left-hand corner of the map shows the route across North Africa from Oran to Bangui, on the border of the Belgian Congo. At Libenge the routes divert, one southwards and westwards to Coquilhatville and Leopoldville, one eastwards and southwards to Stanleyville and Elisabethville. Connexions continue the route through Northern Rhodesia to Mozambique and Madagascar. The first stage of the route to the Congo is from Brussels to Marseilles, 512 miles, and the second, 590 miles, from Marseilles to Oran, the port on the coast of Algeria. For hundreds of miles beyond Oran the journey is over the territory of French West Africa. The first African stage, of 310 miles, is across the Atlas Mountains to Colomb-Bechar, on the edge of the Sahara Desert. Southward from this outpost the aeroplane flies across the Sahara. The next stop is Reggan (373 miles); from Reggan the route is to Aguelock (516 miles) and Gao, 233 miles farther. Gao, on the River Niger, is an air junction. One route goes north to Algiers, the other, running south to the coast, links with the French air services along the coast of West Africa. River craft provide transport on the Niger, and motor vehicles run to Timbuktu and Bamako, on the Niger. The air route to the Congo turns south-east, following the course of the Niger. After a flight of 242 miles to Niamey, there is an eastward turn to Zinder, 463 miles farther. Zinder is another outpost with transport prospects, as it is served by motor transport linking it with British Nigeria and places in French West Africa. The aeroplane continues eastward for 429 miles and lands at Fort Lamy, which is in French Equatorial Africa, south-east of Lake Chad. From Fort Lamy the route turns south-eastwards for 307 miles to Fort Archambault. Thence it turns southward for 332 miles to Bangui, where the Belgian Congo is reached. Bangui lies on the Ubangi River, one of the great tributaries of the Congo River and the boundary between French and Belgian territory for a considerable distance. A short stage of 59 miles ends at Libenge, where the air route forks. From Libenge one service goes south to Leopoldville, and the other goes south-east to Stanleyville and south to Elisabethville. One aeroplane takes the Leopoldville route. The first stage is one of 245 miles to Coquilhatville, on the Congo River, and the second one of 137 miles to Inongo, after which the route trends to the south-west for 121 miles to Banningville. Thence it swings more to the south-west for the final stage of 165 miles to Leopoldville. The Regie Air Afrique machine keeps to the west of this last part of the route from Europe. The French aeroplane diverges at Bangui, omits Libenge but calls at Coquilhatville, and then flies direct to Brazzaville, the port on the French side of the Congo River opposite Leopoldville. Below both towns the great river sweeps over the edge of the African plateau with such force that vessels cannot navigate the rapids. On the Belgian side a railway runs from Leopoldville to the port of Matadi, on the river estuary; on the French side another railway links Brazzaville and Pointe Noire, on the coast north of the estuary and the terminal airport of the French services from Europe and West Africa. An auxiliary air service links Leopoldville with Boma, a port below Matadi. The longer fork of the trunk route extends south-eastward from the Sabena junction at Libenge, the Regie Air Afrique aeroplanes using Bangui. The two routes join at Bumba, 286 miles from Libenge, and proceed to Stanleyville, 226 miles farther. Stanleyville is an important railway, river and air junction on the Congo. The route then is to Kindu 248 miles, to Kabalo 236 miles, to Bukama 242 miles, and finally to Elisabethville 217 miles. Stops are made when required at several other places between Stanleyville and Elisabethville. The shortest railway route from Elisabethville to the Atlantic takes about three days, and the passenger arrives at Lobito, the Atlantic port, to confront a sea passage of about seventeen days before he reaches Belgium. The route from Elisabethville to Lobito is the only continuous railway route to the Atlantic coast, as the journey from Elisabethville to Matadi, the Belgian port on the Congo, is partly by railway and partly by river steamer. From Elisabethville the trunk air route goes to Broken Hill, the mining centre in Northern Rhodesia, to Tete (Mozambique), and on to the port of Mozambique, on the Indian Ocean coast of Africa. The route then crosses the Mozambique Channel to Maintirano, on the west coast of the French island of Madagascar, and inland to Antananarivo. The route from Elisabethville to the coast is operated by French machines. The internal air routes in the Belgian Congo operated by Sabena provide services to various townships which have expanded with the opening up of the colony. From Banningville (see above) a service operates to Port Francqui, Luebo, Luluabourg and Lusambo. traffic. The river steamer takes twelve days to reach Bumba from Stanleyville, but this distance is merely a stage in the aeroplane’s flight from Stanleyville to Coquilhatville, which is made in a day. Feeder air lines to serve the northeastern part of the colony from Stanleyville are projected. Connexion is made at Broken Hill with the Wilson Airways section of Imperial Airways, giving the passenger access to South Africa or to East Africa. It is proposed to establish, in conjunction with South African Airways, an ail line from Leopoldville to Johannesburg. The scheme includes also an air route crossing the Belgian Congo from Leopoldville to Albertville, on Lake Tanganyika. The principal aerodromes in the Belgian Congo are at Banningville, Boma, Elisabethville, Coquilhatville, Leopoldville, Libenge and Stanleyville. All of these are civil customs aerodromes. In addition to other civil aerodromes, there are landing grounds at intervals along the main routes. The country is so difficult of access that aircraft are required to keep to the air routes. If a machine had to land away from the routes the task of getting aid, spare parts or fuel would be a lengthy one. Most of the white population of the Belgian Congo is centred in the mining region of the Katanga, near the borders of Northern Rhodesia, the total white population being about 20,000, and the native population over 10,000,000. Sabena enterprise has brought these remote places to within a few days’ journey from the capitals of Europe. BRUSSELS AIRPORT is the centre for routes operated by Sabena to London, Paris and other European cities. Other Sabena air liners fly regularly between Brussels and the Belgian Congo and operate internal services in the Congo and in Belgium. The air liner illustrated is one of the company’s fleet of Savoia-Marchetti 73s. You can read more on “Air Routes of the World”, “Air Travel to the Continent” and “South Africa’s Air Routes” on this website.